SAN DIEGO (AP) — America’s Cup champion Oracle Team USA returned to the water, three-and-a-half months after its 72-foot catamaran was heavily damaged in a spectacular capsize on San Francisco Bay. Skipper Jimmy Spithill said it was a “fantastic” day in about 10-12 knots of wind. The renewed Oracle sailed for about three hours Feb. 4 with a full crew of sailors plus some engineers, before sea trials began in earnest. “It really was one of the best days we’ve had in a long time,” said Spithill, an Australian who skippered Oracle to a two-race sweep of Alinghi of Switzerland three years ago off Valencia, Spain, to bring the oldest trophy in international sports to San Francisco. “Essentially, we launched a new boat,” he explained. “We made a lot of modifications, so we were all a bit anxious because you don’t know how long it takes to get a boat like this up to speed. You can tell it’s an improvement, no doubt about it. “I’m confident we’ve got a much better boat — a much better product,” he said. The boat capsized on Oct. 16, tumbling stern over bow. It was caught in a strong ebb tide and swept more than 4 miles past the Golden Gate Bridge. The high-tech, 131-foot wing sail was destroyed. Oracle had to wait for a new wing sail to arrive by ship from New Zealand before it could sail again. Spithill and syndicate CEO Russell Coutts, a four-time America’s Cup winner, don’t think the capsize will be a big setback. The Louis Vuitton Cup for challengers starts July 4 on San Francisco Bay, with the winner facing Oracle in the 34th America’s Cup beginning Sept. 7. “Provided we don’t get another setback like that, we’ll be in good shape,” Coutts said. 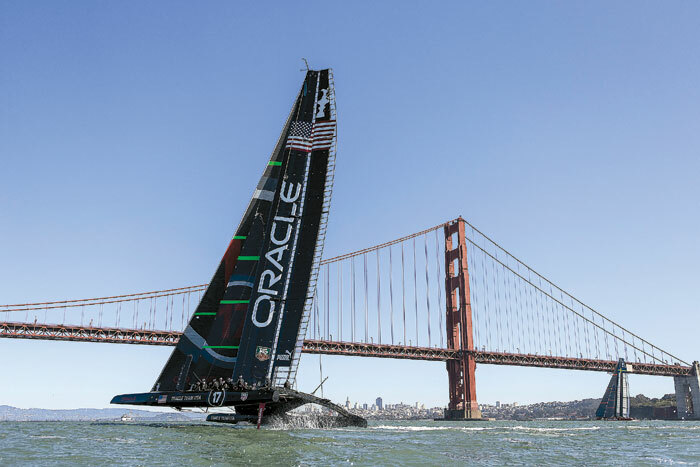 Oracle is building another boat at its San Francisco base and is having another wing sail built in New Zealand. The syndicate hopes to rebuild the wing that was destroyed in the capsize. Coutts and Spithill said there’s still the possibility for mayhem in the big boats, but that the syndicate learned from the capsize. The wing sail looks and acts like an airplane wing, improving the yacht’s speed and maneuverability. The wing sails on the AC72s are an offshoot of the radical 223-foot wing sail that powered Oracle’s giant trimaran to victory over Alinghi in 2010.